Daily Illuminator: You've Got The Power! February 21, 2016: You've Got The Power! When it comes to crypt-crawling in a GURPS Dungeon Fantasy world, the difference between life and death might hang on how much you've got in reserve with your power item to fuel your spells, powers, and super-secret skills. 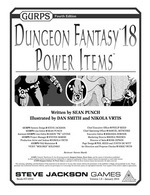 Fortunately, GURPS Dungeon Fantasy 18: Power Items provides you with the upper hand you need to escape with your hard-earned loot. Dungeon Fantasy mastermind Sean Punch is your guide, taking you on an exhaustive look at using, abusing, creating, and upgrading power items. You'll learn how to add value to an existing item to amp its reserves, or transfer your bond to a new shiny treasure. You'll also discover new power-ups and hear whispers of quests that may enable you and your allies to supercharge your item. With Power Items, your adventurer's extra edge has never been sharper. Download it today, only from Warehouse 23!